China's relations with foreign countries extend back thousands of years, reflecting China's long history as an independent nation. The Chinese Buddhist monk Xuanzang brought back Buddhist sutras from India in the middle of the 7th century, during the early years of Tang Dynasty (618-907). Chinese merchant vessels were frequent visitors to Calicut in south India well before the voyages of explorer Zheng He to the Indian Ocean in the early Ming Dynasty (1368-1644). Such activities occurred long before intrepid European seafarers discovered the Western Hemisphere and established colonies there, leading over time to the emergence of the United States as an independent country. Viewed in this context, Sino-U.S. relations are of relatively brief duration. They can be traced back to the last two decades of the 18th century, when a U.S. merchant ship made its first voyage to China five years before the United States was founded in 1789 under its present constitution. Over the ensuing 230 plus years, China's relations with the United States have undergone many ups and downs. The two countries have been allies against common enemies and have fought bitter wars against each other. During the 19th century, Chinese laborers made vital contributions to U.S. westward expansion, while U.S. medical and educational missionaries were helping to spread modern healthcare and education to various parts of China. On the negative side, Chinese have at times been subjected to harsh discrimination in the United States and been barred from entry in violation of U.S. treaty commitments. Americans, in turn, have been the victims of anti-foreigner riots in China. From the beginning, trade has been an important link between the two countries, reaching enormous volumes in good times, and shrinking to near zero when bilateral relations have been strained or hostile. Even when relations have been bad, the lure of trade has provided an incentive to overcome difficulties and put the relationship on a better footing. More recently, distinguished Chinese-Americans have earned Nobel Prizes for scientific achievement, risen to prominence in corporate America, designed architectural monuments in both countries, become governors and vice governors of U.S. states, served in the U.S. Senate and House of Representatives at the Federal level, and represented the United States as ambassador in Beijing. Since the establishment of diplomatic relations between the United States and the People's Republic of China in 1979, U.S. foreign direct investment has flowed into China, bilateral trade is now in excess of $500 billion per year, and the U.S. Chamber of Commerce in Shanghai is now the largest in the world. As China's economy has grown and prospered, Chinese foreign direct investment in the United States has also begun to rise rapidly and is widely distributed throughout the U.S. territory. Against this checkered background, Sino-U.S. bilateral relations are as important as they are complex. With the realization of China's dream of restoring the nation's position as a wealthy and powerful member of the international community drawing ever closer, strategic rivalry between China and the United States has been increasing. If left unchecked, this rivalry could cast dark clouds over the future of East Asia and the world. And yet, each country has frequently viewed the other with admiration and respect. Americans are in awe of China's ancient culture, its respect for learning, the creativity of its people--which gave the world such inventions as paper, printing, gunpowder and the compass--and its exquisite cuisine. Chinese have admired the United States for its high levels of modernization, its scientific advances, the freedom and openness of its society and the opportunities for people to better their situation in life. Improved understanding of the history of bilateral relations between China and the United States will better equip people in both countries to recognize the opportunities and avoid the dangers that lie ahead. Every country has its own particular view of its own history, even though individual interpretations of that history may vary widely. This reflects in part the way that history is taught in schools, and in part the natural tendency of human nature to interpret their own country's actions in the best possible way and to play down or explain away instances of questionable or less honorable behavior. Many Americans are shocked to find how U.S. history is taught in foreign schools, where the judgments on U.S. behavior may be quite different from those at home. To cite one example, the majority of Americans believe that the use of the two atomic bombs against Japan in the final days of World War II was justified by the enormous American casualties that would have resulted if the United States had been forced to invade Japan's home islands in order to bring the war to a close. I was surprised in the Soviet Union several decades ago to discover that Russians held a very different view. They believed that Soviet entry into the war against Japan in its final stages had guaranteed Japan's defeat, making use of the atomic bombs unnecessary. In their view the sole purpose of the United States in dropping the bombs on Japan was to intimidate the Soviet Union by demonstrating that the United States had a powerful weapon that Moscow had not yet developed. I am unaware of any evidence in the historical record to support this interpretation of U.S. behavior, but such differing assessments can foster animosity and mistrust. Such considerations underline the importance of Professor Tao Wenzhao's brief but comprehensive history of China-U.S. relations. The publication of this history in English will make it more accessible to American readers, who are generally unfamiliar with how U.S. history is taught in Chinese schools. 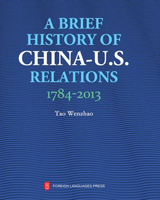 Many if not most of the facts and interpretations in Professor Tao's book are consistent with U.S. histories of Sino-U.S. relations, but in a variety of instances the emphases will be different. For example, many U.S. readers may be surprised to discover that Americans were actively involved in opium trafficking in China in the early 19th century and that the U.S. Government only belatedly began actively to discourage such trade when forced to do so by public opinion in the United States. When I studied U.S. and Asian history as a college student many decades ago, we learned that the British were responsible for the opium trade with no mention of U.S. involvement. Such examples illustrate why the publication of Professor Tao's book is a welcome development. Serious readers will gain an improved multidimensional understanding of the historical interactions between China and the United States that can provide a better base for managing the bilateral relationship in the future.